The waterfall is separated into different falls by rocks and trees with a total drop is 30 m (98 ft). It is located on the border of China and Vietnam but despite the proximity of the neighbour, crossing between the countries can be a hassle. The waterfall is flowing fairly well, year-round but clearly the best season to see the full flow is late Summer through Autumn. During that time the thundering effect of the water hitting the cliffs can be heard from afar. In April the flow is at its lowest. 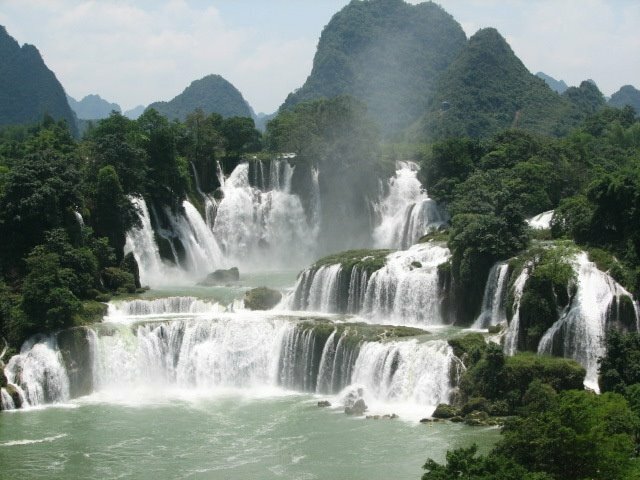 The nearest city is Nanning and here you will find organized tours to Detian Falls. The ride will take 4-6 hours depending on the driver. You can do the trip in one day but it will be a long day. There are also some hotels right at the falls if you want to take more time. If you don’t want to start from Nanning, a much closer option is a smaller town called Daxin. The tour price from Nanning is around $50. Out of crazy walkways, this has got to be one of the craziest. Near the top of the Tianmen Mountain, on a sheer rock face goes this 60m long walkway. The Kuang Si Falls is a three tier travertine waterfall about 29 kilometres south of Luang Prabang. The falls begin in shallow pools atop a steep hillside. These lead to the main fall with a 60 metres (200 ft) cascade.